The Schubert Club, Ordway Center, 10/2/07: The 125-year-old Schubert Club launched its annual International Artist Series with a performance by "the most sought-after trio in the world," the Eroica (not a word that's missing a t, eroica is Italian for heroic, and the name of Beethoven's Third Symphony). They played beautifully and looked fabulous, wearing the slinky gowns shown here and amazingly high heels. Pianist Erika Nickrenz is tall; her piano bench was perched on four little trapezoid-shaped columns for extra height (someone should tell jazz pianist Jon Weber about those). They played Jean-Baptiste Loeillet's Trio Sonata No. 2 in B minor; three tangos by Astor Piazzolla; Paul Schoenfield's "Cafe Music," commissioned by the Saint Paul Chamber Orchestra and based on an idea Schoenfield had while sitting in for the pianist at Murray's Restaurant (home of the Original Silver Butterknife Steak); and Schubert's Trio No. 1 in B flat Major, Op. 99. 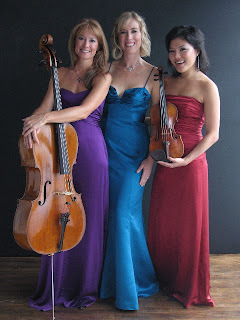 I loved the sensuous, smoky tangos and the witty Schoenfield. The Schubert happened after intermission, and by then we were at Kincaid's sipping martinis and ordering steaks. I'm sure the Schubert was exquisite but we were hungry and, as I looked at the program and pondered what to do (stay? leave? ), what sealed it for me was realizing that the Eroica would bring their own stamp and flavor to the piece, but there would be no improvisation and I could listen to a recording later (the Beaux Arts Trio on iTunes, for example). Jazz may have spoiled me for written-down, played-by-the-note music. Listening to the Loeillet, my mind strayed and I wondered, "Why does the second i in violin change to an o in violoncello?" Photo from the Eroica Trio Web site, Gallery section. I think it has something to do with family name, you know, violin, viola, violoncello, violone (double bass).. anyway. You're right the Schubert probably was exquisite but the Piazzolla and Schoefield take the musician and audience to a different place. Both of those composers are also wonderful improvisers. I believe they are both jazz composers at heart. So, why, if such exciting music is being composed by today's jazz composers is it generally not more often heard as repertoire of Schubert Club musicians? Or on most classical stages for that matter. Is it the audience? Is it the musicians? Is it the social context? The answer to your question might have to do with the fact that we define and categorize music. We want to hear a certain type of music, and we go to a concert expecting to hear that type of music. Categorizing makes us comfortable. I know I do it. For example, if a group is labeled "smooth jazz," I tend to avoid it. I'd love to hear more Schoenfield. Any recommendations?